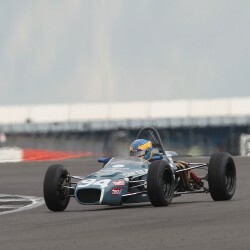 Michael claims the championship lead with solid Silverstone performance. - After a very strong showing at the season opening race at Donington Park, which included a pole, lap record and coming within 0.005 of the race win, Michael looked to go one better at Silverstone with the main aim of securing the championship lead after round 2. We came into the Qualifying with high expectations, after a very promising day of testing on Friday where we consistently topped the times. At the conclusion of qualifying, we ended up P2, after topping virtually the whole session; Michael got piped at the last minute by a former champion Callum Grant who benefited from a slipstream around the whole circuit to claim pole. As the race was approaching, conditions started to get worse and the rain closed in. As the cars set off on the warm up lap, the heavens opened and huge downpour led to a red flag and a delayed start. After the rain cleared the race got underway in what can only be described as torrential conditions. Michael grabbed the lead early on the exit from the first corner and looked to check out from the chasing pack. With a healthy 1.9 second advantage coming into the final few laps, back markers unfortunately played their part in the race with Michael having to take avoiding action and run wide, losing him the lead with only half a lap remaining. Coming out of the final corner, Michael was right back behind and got a brilliant exit to pull up alongside but sadly it wasn't quite enough and he'd go on to finish 2nd, just 0.3 behind the race winner. Although Michael and the whole team were frustrated to miss out on the victory by so little, the most important thing was to lead the championship leaving Silverstone which is exactly what we've achieved. Having not qualified or finished outside of the top 2 in the opening rounds, Michael and the Team head to Cadwell on the 17th on June for the third round of the 2017 season showing brilliant consistency and speed.